We specialize in database-driven custom web and software design, implementation and support within a wide array of business and technology. We can help you organize and distribute your data with an easy-to-use interface and powerful functionality. 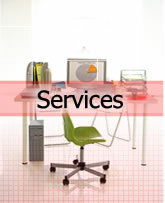 We will analyze your business requirements and create a comprehensive solution that meets your requirements. We work with any industry. We provide free initial consultations. Once we know the scope of the project and we have defined the requirements, we will model a database for your business. We will provide sample pics of the user interface that can be revised until the client is satisfied. Once the design has been approved, we will start coding the project and go through extensive product testing. Once the project is completed, we will walk you through the	installation. We will also provide training and documentation on how to use the software. You will have time to test the new software before it goes live. Any bugs or undocumented features will be fixed. If any errors should occur, we will provide free support and resolve any issues promptly.